This article is about the archetype. For the card whose Japanese name is "Valkyrie", see "Dark Witch". For the card part, see "Valkyrie" (card part). Zigfried with "Valkyrie Zweite", "Valkyrie Erste" and two "Valkyrie Dritte". "Valkyrie", known as "Walkure" (ワルキューレ Warukyūre, from "Walküre", the German word for "Valkyrie") in Japan, are an archetype of LIGHT Fairy female monsters used by Zigfried von Schroeder in Yu-Gi-Oh!. They debuted in the TCG in Shadows in Valhalla. "Element Valkyrie" and "Valkyrie of the Nordic Ascendant" are not "Valkyrie" cards, because they do not have 「ワルキューレ」 in their Japanese names. The concept of the "Valkyrie" cards is derived from the valkyries of Norse mythology. Like most of Zigfried's cards, the "Valkyrie" cards are named after characters from the opera Der Ring des Nibelungen. The effects of the "Valkyrie" cards vary slightly, but usually revolve around Special Summoning "Valkyrie" monsters, banishing cards from the opponent's Graveyard, and increasing their ATK. 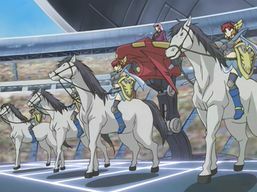 The main strategy of this archetype is to swarm the field with "Ride of the Valkyries" and attacking in two consecutives Battle Phases with "Mischief of the Time Goddess".